A Florida father made headlines recently when he boarded a school bus to confront the kids who were allegedly bullying his disabled 13-year old daughter. James Jones was arrested following the incident, which was caught on surveillance tape. He is accused of entering the bus and, in a profanity-filled tirade, confronting the 13-year old boy who allegedly placed an open condom on his daughter's head, smacked her on the back of the head, twisted her ear and shouted rude comments at her. The video also shows him threatening the bus driver. While most fathers who have viewed the tape online agree that Jones went a little too far, you have to admit that the thought of confronting any person who harms your kids physically or otherwise has entered your mind, especially if your child can't defend him or herself. Experts say it's okay for fathers to get involved, especially if their kids have reached out to them for help. Some pieces of advice that dads can give their kids to avoid the bullying is to use a buddy system, walk away or verbally challenge the bully. 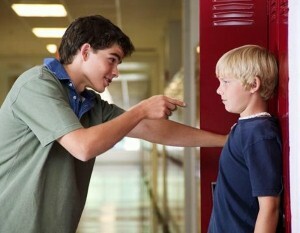 Parents may also choose to contact the bully's parents to get the behavior to stop. Speaking with a teacher or the school principal can also be helpful. It's important for fathers to remember that even a bully is someone else's child, and that not controlling your own behavior does not set a good example for your kids.